Welcome to Napkin Folding Guide. Here’s the appealing Diamond Napkin Fold. This one’s a real time saver and easier with limp napkins. If you only have stiffies then an iron will make this simple to do. Got some really limp napkins and want something nice to make without eating up too much time? Then this one’s for you, if you’re using thick/stiff napkins then an iron will help. 4. 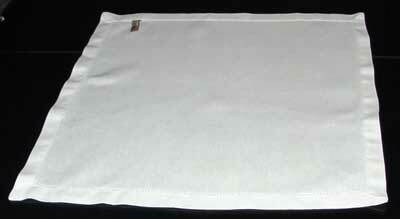 Fold the top-most layer of the napkin in half diagonally – up and to the left. 5. Fold the next layer of napkin diagonally up and to the left, stopping slightly before the last fold to create an even, staggered effect. 6. Repeat by folding up the next layer of napkin to a point just before the last one. 7. And one last time with one last layer. Keep them as uniform as you can. 8. Now fold both sides of the napkin under and in to create an even, staggered diamond effect on the napkin. Press it down as flat as possible and you’re ready for guests within 60 seconds!